Volvo is a manufacturer that I have complete respect for. Their cars seem to be long-lived and capable of surprising levels of performance. In Scandinavian countries cars like our feature car continue to compete successfully in both rallying and rallycross. You will find this Volvo listed for sale here on eBay. Located in Colorado Springs, Colorado, it is offered with a clear title. The seller has set a BIN of $2,400 with the option to make an offer. 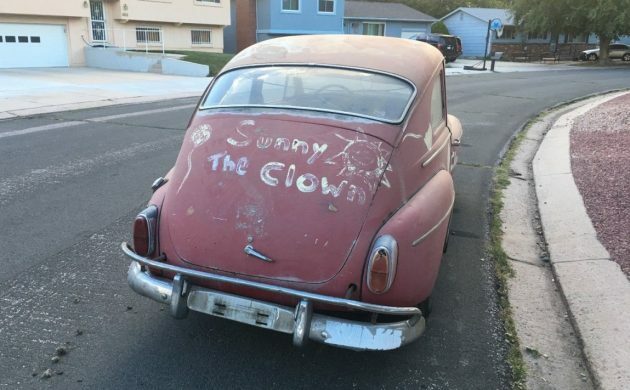 I wonder who “Sunny The Clown” is or was. Certainly Sunny chose a mode of transport that was distinctive. This car has literally just been pulled out of a barn and we have no idea how long it resided there. 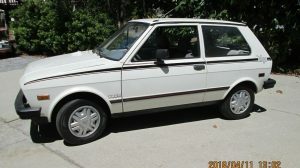 The seller states that the car is 99% rut-free, and certainly the supplied photos don’t seem to indicate any major problems. There is are spots on a couple of the bolt-on panels where they meet the main body structure and a bit appearing under the front trim on the driver’s side, but none of these seem to be too bad. Due to the environment that they were designed to operate in, Volvos don’t tend to be prone to major rust issues. There are a couple of badges that are missing and the lenses on the tail-lights will need replacing, but everything else appears to be present. The front bumper which is not attached does come with the car. 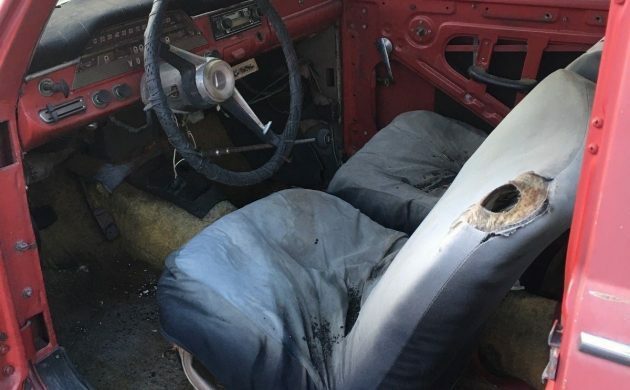 The interior is going to require complete restoration. 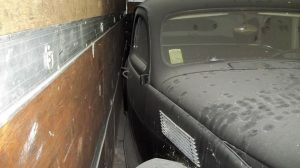 The door trims are in the trunk, but looking at them suggests that they are beyond help. The dash pad has deteriorated badly, but the dash appears to be largely intact. There is a radio/cassette fitted with a graphic equalized under the dash, so Sunny The Clown must’ve liked the music loud. There are covers on the seats, but we can see that what is peaking through appears to be pretty sad. I’m not sure, but I think that there is evidence that the Volvo may have been a home for rodents at some stage, so there may be some issues with the electrical system to deal with. 1962 marked the introduction of the B18 engine into the 544 range. Available in two versions, this one is the more powerful B18D which was the more common engine for the 544 in the USA. This is backed by a 4-speed manual transmission. 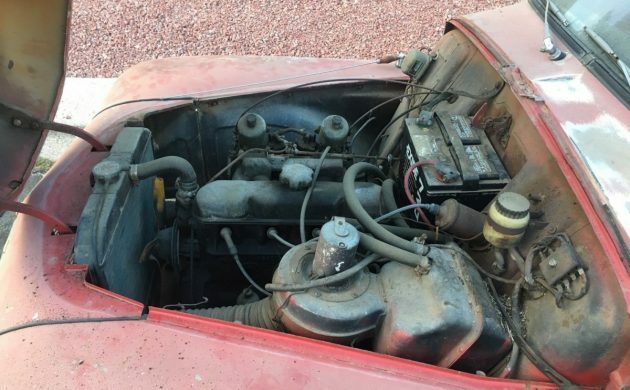 The seller states that the engine turns over by hand, but that it doesn’t run. These B18 engines are also very robust, so it may not be a big job to get it running. It could well be that the rodent invasion that I speculated about may have resulted in issues with the ignition wiring. This was also the first year that Volvo introduced a 12 volt electrical system into the 544 range, meaning that the car tended to be easier to start in colder climates where the 6 volt system could be found wanting. 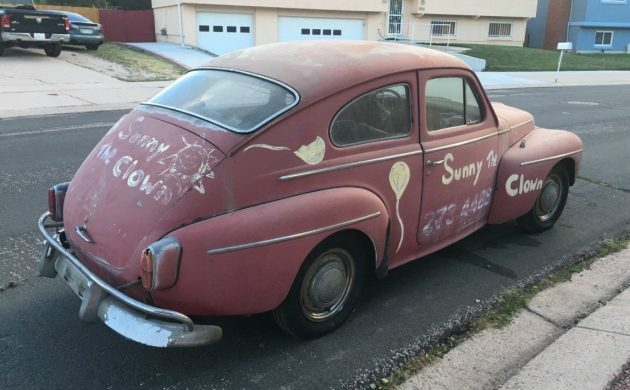 I’m sure that wherever Sunny The Clown is, he or she is hoping that someone will be willing to revive this 544. The price for this example is really competitive compared to cars in a similar state. In good condition these are realizing prices in the vicinity of $12,000 plus. I wouldn’t be at all surprised if some tinkering brought the engine back to life. I really think that this is a viable project, and when restored these are a really satisfying car to own and drive. I was Never Volvo fan but aa classic collector Now I like very much to add 1978 Volvo 262C Bertone to my collection !! These are neat cars and this one would be a fun addition to anyone’s collection (not mine!). Did this model of Volvo officially find their way to NewZealand ? (Actually I do not believe they were ever manufactured as right hand drive; unsure. ) They’d have been a decent rugged car for Kiwi motorists in th day….especially those away from the cities. Sweden was a right hand drive country (drive on left side of the road) until… 1968, I think. Gee. I’d be interested in that if I weren’t so deeply mired in a long term project at the moment and I’ve promised myself (and my wife) that I would always finish one project before starting another. I have a deep affection for the 544 and that looks like a good candidate for a real nice driver. 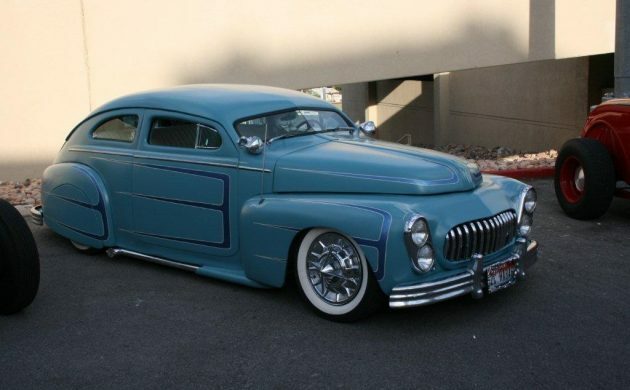 always loved the style of this Volva..reminds me a little of the 40 ford. Also pictured one of these with a v8. This one has a lot of potential. Get that 4 banger going and have fun. Think I’d remove the clown lettering, whats that disorder that’s the fear of clowns?? Good luck to the new owner! 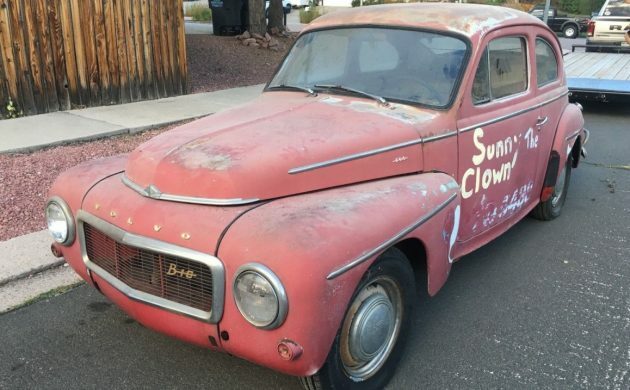 “Coulrophobia” The fear of a Volvo-driving clown tampering with your Coulro area. Very economical for car pooling 60 of your fellow clowns to parties. The 544s are a tough little car. Back in 1962, a buddy of mine put a Latham blower on a new 544, and drove it like it was only meant to last a week. The car was driven hard, and stood up like a trooper. The running gear was strong enough to handle all the abuse without any breakage. 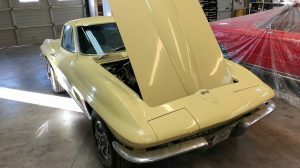 He finally traded it off for a new 1964, 365 HP Corvette. My dad has one of these. He bought it used 50 years ago for $50. He still drives it every summer. OMG!! One of first cars I ever worked on! even the back row with the other beaters! which was unusual for an Illimois car. which was worn on the driver’s side. leaked fuel, and caused a fire hazard. 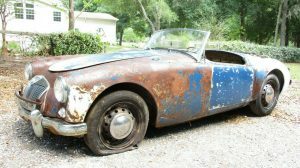 could save a lot more old cars that eay! This is superb. I love ‘real’ Volvos; this certainly is one of them. The clown lettering makes me think of ‘American Horror Story’. Has anyone checked the boot/trunk to see if Sunny is still in there 🤡 👻 💀 ? I’m in Australia and have too many projects on the go, wish I could sell a couple straight away to get the $$ to have this imported. Superb project. I love the lettering; I guess it would have to go. A shame. Wonder who Sunny was? Right era for the Twilight Zone……. I recall as a younger fellow…..about40 years ago there was a guy who put a straight axle front end and a huge injected v8 in to one of these. He ran in the gas altered category. That car was wickedly fast. Ah the good old day memories. 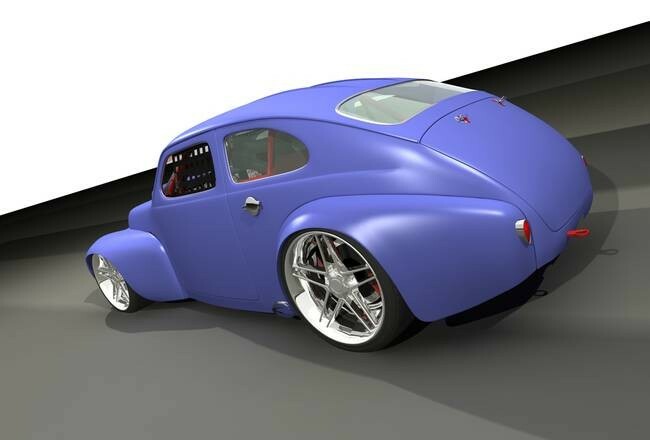 Many have made replicas of fat-fendered 46-48 Fords out of these. I’ll see if I can find a photo. Not a matter of if, or when. It’s already happening! Yayah!! Love it. 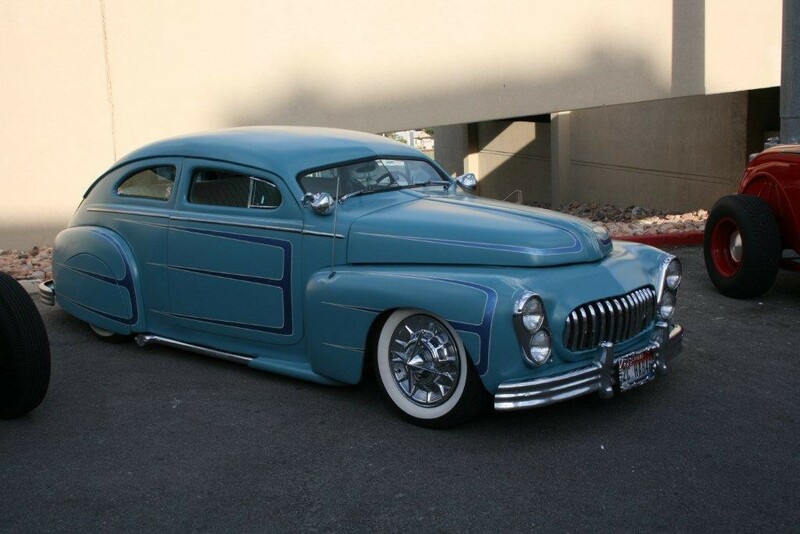 A mini ’50 Mercury (or so it seems). Good job!! But, someone, other than me, has really deep pockets. “99% rut-free” I know that this is a typo, but the juxtaposition with “Sunny the Clown” is pretty funny. A friend of mine had one of these that he fixed up really nicely and raced it in the Mini Class at Cheyenne, Wy., InterMountain Speedway. That was over 22 years ago. It was painted a beautiful red. Inside was immaculate, as was under hood. Many of these cars were not only race cars, they were show pieces, too. Wish I had a pic of Glen’s car to post. My first car was a 61 Volvo PV544. Paid $200 for it back in 1973. Learned to drive on the dirt back roads of eastern Arizona. I had just turned 15. Couldn’t believe how Volvo got away with putting Renault V-6’s into their vehicles in the ’80’s! Junk engines! Oil delivery problems resulting in worn out cam lobes. How they avoided a mass class consumer suit I never understood. Perhaps they had sidestepped liability due to Swedish corporate identity which made litigation here a non starter? If G.M. was found culpable in court here, for selling generic engines across their product line (I believe a Cad owner successfully won significant damages after he learned his engine was originally designed for, and installed in, Chevolets?). If anyone has more on this topic, I would like to hear more. It’s been relisted at a BIN of $2K. I wish it were closer. I had one of these long ago. It was fast as hell to 60 mph. I used to whoop BMW 2002’s til 60, then the B18 ran outta steam.